One day, those who have no time for God will have to take the time, for all those things which have kept them too busy will no longer exist, and they will no longer matter. All things pertaining to this earth will have passed away. They will be summoned to appear and stand before God to give an account of their earthly life. One day, those who think themselves so great they do not need God will have a mandatory meeting with God. At that time they will bow their knees in worship, only to find God never knew them. They will be cast out from God’s presence into everlasting punishment, with all other unbelievers. One day, those who feel they are too small to be counted worthy, but have placed their hope and trust in the Lord, will be summoned to appear before the throne of God to receive their rewards for their faith and works here on earth. 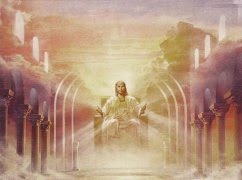 One day, those who have been great here on earth, but have placed their hope and trust in God, and have come before Him humbly as little children, will be summoned to appear before the throne of God to receive their rewards for their faith and works here on earth. © 2007 Thomas E. Kittrell~ Please Click here to visit ! For we obey His command.